I’m just a humble boxing writer. I periodically hop airplanes, frequently gas up cars and periodically camp out alongside a big-screen TV in order to stay on top of news from the ring. But it’s high time for a midlife career change. Forget the keyboard-toting and deadline-taunting. I want to be a promoter. More specifically, I want to promote fights in the 154-pound division. And if you don’t understand why, then you clearly weren’t in Brooklyn – or tuned into Showtime – on Saturday night and into Sunday morning. Across three hours that sandwiched midnight on the East Coast, the junior middleweights (or super welterweights, if you prefer) took center stage and provided myriad evidence as to why they are the sport’s most interesting – if not yet the most star-studded – weight class. Long gone are the days when 154 was merely a brief pit stop on the welterweight/middleweight expressway for legends like Roberto Duran, Thomas Hearns and Ray Leonard, or, more recently, even slightly lesser-wattage lights like Canelo Alvarez, Miguel Cotto and Sergio Martinez. 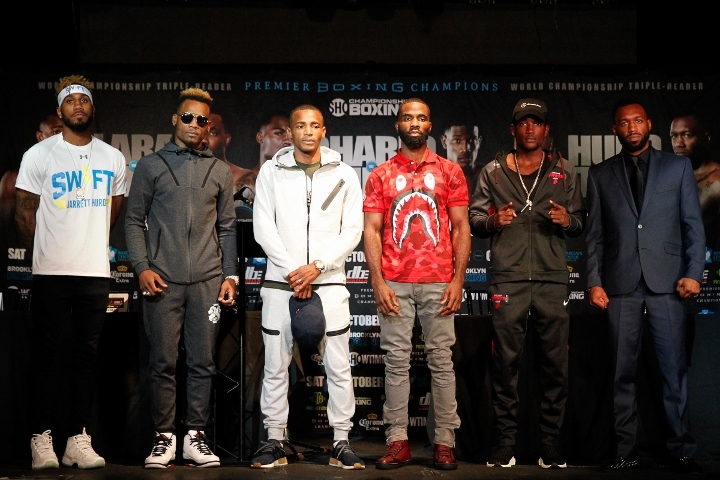 These days, in fact, it appears as if the belted likes of Erislandy Lara, Jermell Charlo and Jarrett Hurd plan to stay awhile, and they seem pretty eager to knock each other around on the way to doing so. Charlo followed up with a shockingly sudden one-punch erasure of elite prospect Erickson Lubin, held his own amid a brief post-fight melee between the two contentious camps and immediately suggested Hurd had become his most coveted quarry. And while it’s true the Barclays Center house didn’t come down in the afterglow of Lara’s tactical smothering of Terrell Gausha, the one-sided victory should do nothing to smudge the championship portrait the Cuban has been painting since a narrow loss to Alvarez three summers ago in Las Vegas. He upped the ante, too, when he said he’d be willing to face Charlo, a fellow resident of Houston and a former teammate with trainer Ronnie Shields at the city’s Plex gym. The best thing about my new vocation is that the possibilities don’t end with the trio. A glance at the latest Independent World Boxing Rankings shows the depth of the 154-pound field and, therefore, the number of interesting, compelling and violent matchups that could be in the cards. Lara, Charlo and Hurd entered the weekend at Nos. 1, 3 and 5, respectively, sandwiching ex- and reigning WBO champions Demetrius Andrade and Cotto at places 2 and 4. Recent Hurd and Charlo victims – Tony Harrison and Lubin – stand sixth and seventh, while the either reprehensible or intriguing specter of Antonio Margarito (unbeaten in a three-fight comeback that followed a beating from Cotto in 2011) hovers ominously and within matchmaking distance at No. 12. Stay tuned for the fight posters and the rematch clauses. “Today’s junior middleweight class isn’t as strong as the division was in the 1980s, when you had the four kings (Leonard, Duran, Hagler and Hearns) hovering around 152,” said Showtime’s Steve Farhood told Premier Boxing Champions. “But is growing and has something to aspire to. I break down the division today into three categories. You have the veterans, which is obviously Lara and Trout, the other is the young stars, which is Jermell and Demetrius Andrade, who could move to middleweight, and then the younger guys, like Lubin, who could be a future champion. Easy job! Schedule fights once a year! don't forget about brian castaño. he is the interim WBA champion. war brian!!! I enjoy seeing fighters embrace the heel role and show some attitude. I'd much rather that than all this stay humble BS and dedicating victories to god.